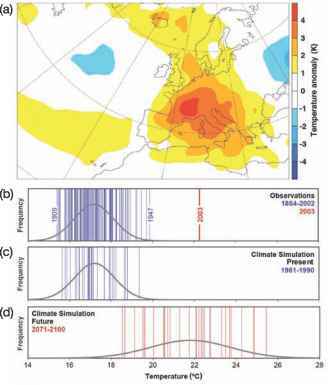 A severe heatwave over large parts of Europe in 2003 extended from June to mid-August, raising summer temperatures by 3 to 5°C in most of southern and central Europe (Figure C1.1). The warm anomalies in June lasted throughout the entire month (increases in monthly mean temperature of up to 6 to 7°C), but July was only slightly warmer than on average (+1 to +3°C), and the highest anomalies were reached between 1st and 13th August (+7°C) (Fink et al., 2004). Maximum temperatures of 35 to 40°C were repeatedly recorded and peak temperatures climbed well above 40°C (André et al., 2004; Beniston and Díaz, 2004). The heatwave was accompanied by annual precipitation deficits up to 300 mm. This drought contributed to the estimated 30% reduction in gross primary production of terrestrial ecosystems over Europe (Ciais et al., 2005). This reduced agricultural production and increased production costs, generating estimated damages of more than €13 billion (Fink et al., 2004; see also C1.2.2). The hot and dry conditions led to many very large wildfires, in particular in Portugal (390,000 ha: Fink et al., 2004; see also C1.2.1). Many major rivers (e.g., the Po, Rhine, Loire and Danube) were at record low levels, resulting in disruption of inland navigation, irrigation and power-plant cooling (Beniston and Díaz, 2004; Zebisch et al., 2005; see also C1.2.3). 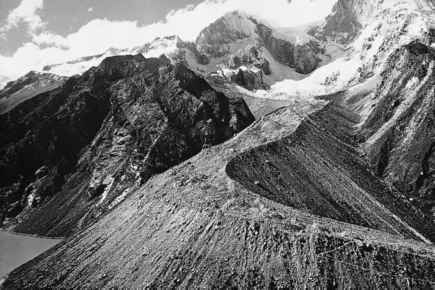 The extreme glacier melt in the Alps prevented even lower river flows in the Danube and Rhine (Fink et al., 2004). 2006) and Hungary (Kosatsky and Menne, 2005). Figure C1.1. Characteristics of the summer 2003 heatwave (adapted from Schäret al., 2004). (a) JJA temperature anomaly with respect to 1961 to 1990. (b) to (d) JJA temperatures for Switzerland observed during 1864 to 2003 (b), simulated using a regional climate model for the period 1961 to 1990 (c), and simulated for 2071 to 2100 under the A2 scenario using boundary data from the HadAM3H GCM (d). In panels (b) to (d): the black line shows the theoretical frequency distribution of mean summer temperature for the time-period considered, and the vertical blue and red bars show the mean summer temperature for individual years. Reprinted by permission from Macmillan Publishers Ltd. [Nature] (Schär et al., 2004), copyright 2004.